Wash, snap the ends and chop fresh beans into app. inch long pieces. Peel ginger and garlic cloves. Remove stems, wash and roughly chop green chillies. Coarsely grind ginger and garlic with green chillies using a blender. Heat oil in small wok, add urad dal, mustard seeds, cumin seeds, broken red chillies and curry leaves. When dal turns light brown, add flat beans, milk, turmeric powder and green chilli ginger paste. Cook covered on medium – low heat by stirring occasionally until beans turn soft. Uncover and fry for few more seconds until any leftover moisture is gone. 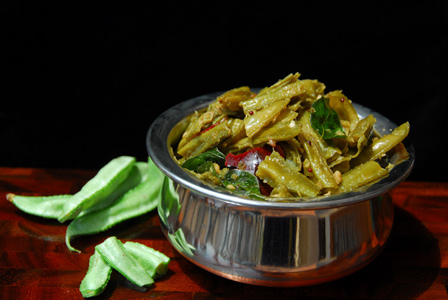 Season with salt and serve spicy fresh beans with steamed rice or roti. Notes: Don’t overcook fresh beans. Soak moong dal in water for half an hour and discard the water to make vadapappu. Mix rice flour with grated jaggery and little bit of water to make thick dough called chanividi. Roll the dough into small balls and remove onto a bowl. 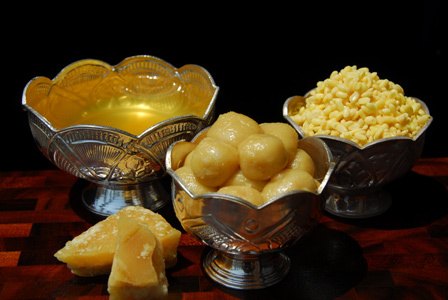 Soak 4 tbsps of grated jaggery in a cup of water. Add ground peppercorns to the above mixture. Strain the whole solution through a muslin cloth to make panakam. Notes: Typical neivedyam during any type of pooja contains these three offerings. Wash, remove ends and chop tendli vertically twice. 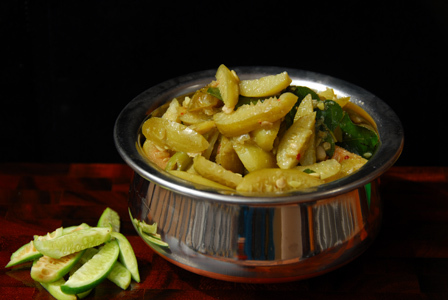 Peel ginger, remove stems and wash green chillies. Lightly grind ginger with green chillies in a spice blender. Heat oil in small wok, add urad dal, mustard seeds, cumin seeds and broken red chillies. When dal turns light brown, add sliced tendli and salt. Cook covered on medium flame until the tendli turns soft without getting mushy. Uncover, add ginger green chili paste and stir. Fry until the rawness of green chili is gone. Notes: Don’t overcook tendli (tindora). 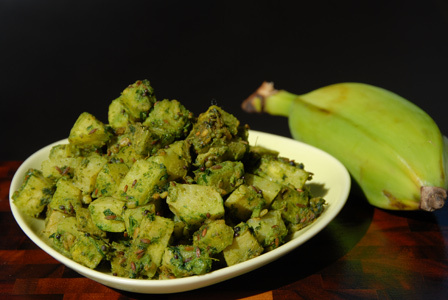 Remove ends, chop off the skin and cut the plantain into small cubes. Soak them in water until needed to avoid blackening. Grind chopped cilantro, ginger, green chiles and salt into coarse paste enough water. Heat oil in a pan, add urad dal, mustard seeds, cumin seeds and asafoetida. When dal changes color, add plantain cubes, cilantro green chile paste and about half a cup of water. Cook covered on low flame until the plantain is soft. Uncover and stir fry to remove any excess moisture. Notes: If plantain doesn’t feel soft while cutting, first microwave the plantain cubes soaked in water until cooked. Wash moong dal thoroughly in water. Remove stems, wash and slit the green chiles. Bring to boil 3 cups of water, add moong dal, salt and turmeric powder. Strain the dal once its cooked. Bring to boil 3 cups of water, add chopped cluster beans and salt. Refresh in cold water once beans are soft and cooked. 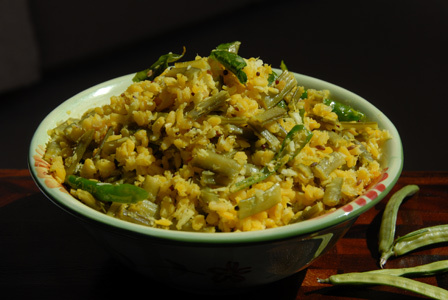 When dal changes color, add green chiles, cluster beans and moong dal. Stir fry until all the moisture is gone. Garnish with fresh coconut and serve with steamed rice. Notes: Make sure dal and beans are not overcooked or undercooked.